The gummy vitamins market remains consolidated at the bottom with regional players holding over half of the overall market share. 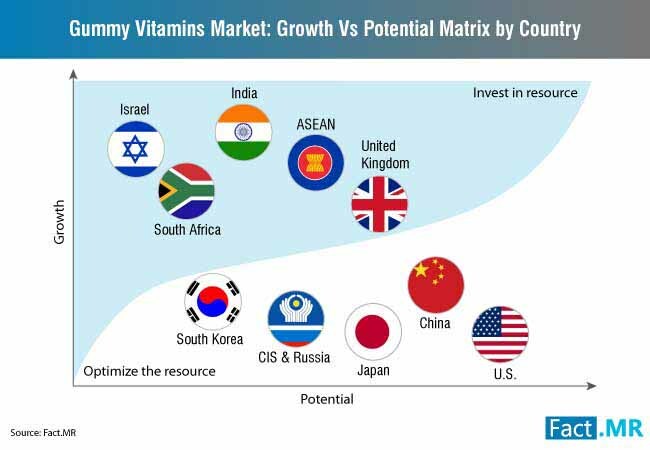 Increasing demand for vitamin supplements to overcome nutritional deficiencies has triggered a stiff competition amongst market forerunners and emerging players. 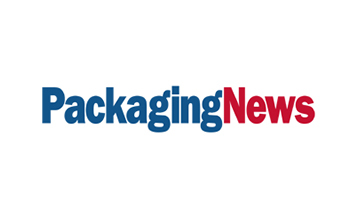 To capitalize on the growing demand for vitamin supplements, companies are expanding their manufacturing facilities, while acquiring other local companies to gain a competitive edge. Further, these companies are launching new product lines offering consumers a variety of flavors while providing an increased nutritional value. 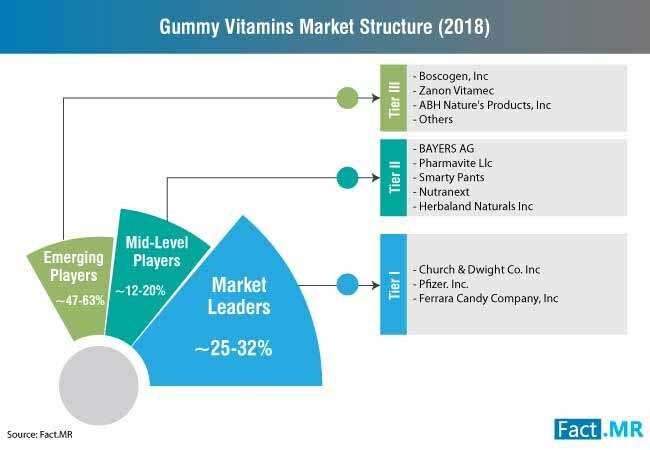 The competition is further expected to intensify as both confectionery companies and vitamin supplement enterprises venture into the gummy vitamins market. The constant tussle to improve nutritional quality, while providing palatable flavors, is one of the key causes that is allowing new and emerging players to lure in extensive consumer base, which is constantly on the lookout for flavorful vitamin supplements. Anticipating continued bullish prospects of the gummy vitamin market, The Clorox Company acquired Nutranext that specializes in the manufacturing of vitamin dietary supplements, for USD $700 million in 2018. With the acquisition, Clorox aims to broaden its portfolio of dietary supplements in the market. To leverage the growing demand for organic and non-GMO products, vitamin supplement specialists, Smarty Pants launched the first line of organic gummy vitamins in SmartyPants Organics. According to the company, the new product line offers the first of its kind organic, vegetarian nutrient supplements enriched with probiotics and omega-3 and are produced to cater to the needs of the whole family. Trailing the trend of innovation in the gummy vitamins market, CV Sciences launched a hemp-derived cannabidiol gummy product manufactured using its PlusCBD Oil product in two flavors cherry mango and citrus punch in 2018. The company plans to market the product as a functional food in addition to being a dietary supplement. Anticipating the exponential rise in the demand for gummy vitamins around the world, SIRIO Pharma and Co., a company which specializes in the manufacturing of nutraceuticals, opened a 26,000-sq-meter plant to increase its gummy vitamin production to over 2 billion gummies per year. 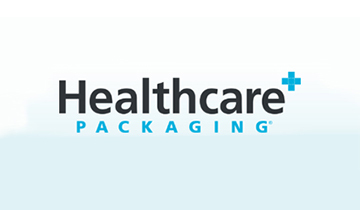 The company plans to utilize the facility to launch multiple standards of formulation such as sugar-free, low sugar, and vegan options in the U.S. and European markets. Detailed profiling of other leading market players operating in the market has also been included in the gummy vitamins market report. 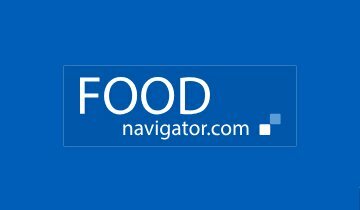 Key players operating in the gummy vitamins market include Bayer AG, The Honest Company, Inc, Pfizer Inc., Olly Public Benefit Corporation, Pharmavite LLC, Zanon Vitamec, Life Science Nutritionals, Boscogen Inc., Hero Nutritionals LLC, Church & Dwight Co. Inc., and ABH Nature’s Products Inc.
Vitamin or micronutrient deficiency is one of the most prevalent health concern among the global population. According to a recent report by WHO, over 2 billion people around the world suffer from micronutrient deficiency. This widespread prevalence of vitamin deficiency can be attributed to various factors that range from chemical and mechanical alterations in natural food, to lax nutritional and labelling requirements. The changing dietary patterns of consumers worldwide has put them at a greater risk of micronutrient and vitamin deficiency. Severe health concerns have been associated with vitamin deficiency, including beriberi, rickets, scurvy, and anemia, apart from impacts on pediatric physical and mental development, and neurological problems. These concerns have been advocating the consumption of vitamin supplements among consumers, in line with surging health & wellness trend. Future prospects for gummy vitamins market are envisaged to be promising, as these health supplements gain ubiquitous acceptance among adults and children alike, with manufacturers’ efforts toward development of flavored gummy vitamins while retaining their efficacy. The gummy vitamins market continues to witness product diversification, with consumer demand for new flavors and ingredients in these supplements. In order to expand their footprint in the gummy vitamins market, companies are introducing a variety of products with added nutritional value. Apart from the basic chewable multivitamins, companies are offering gummies with ingredients such as probiotics, omegas, and other immunity-boosters. Other unique offerings include organic gummies, vegan gummy vitamins, and wheat and gluten-free vitamin supplements. Additionally, leading gummy vitamins manufacturers on novel flavor offerings that range from grape to cherry and orange, to meet the varying consumer needs for taste. Added health benefits coupled with the different flavors continues to remain a key growth strategy of gummy vitamins market players. There has been a marked rise in spending on personal care-specific gummy vitamins, particularly among the female demographic. In a bid to tap potential opportunities in this space, manufacturers are taking efforts in development of gummy vitamins that include Vitamin A, C, and E - known to promote skin health, while complementing hair growth. The benefits associated with these vitamins, coupled with the added nutritional value of probiotics and other nutrients, are being leveraged by beauty supplements manufacturers to market gummy vitamins.. For instance, iRestore Hair Growth system launched its very own line of iRestore Hair Gummy Vitamins which claims to fight hair loss, dry hair and improve the overall growth and quality of hair. On similar lines, several other companies have launched gummy vitamins for a better complexion, nails, and even natural tanning. The adoption of beauty vitamin supplements is anticipated to rise as companies employ rigorous marketing strategies to promote their products. Manufacturers often use sugar and other artificial flavorings to cover up the natural taste of vitamins. 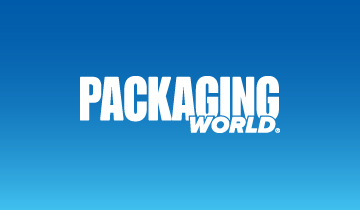 Moreover, the use of preservatives to increase the shelf life of products is a common practice. However, researches have linked sugar and other artificial substances used in the manufacturing of gummy vitamins with multiple health problems which have raised questions on the effectiveness and benefits of vitamins. Moreover, recent research alluded most gummy vitamins to contain either exceeding or limited quantities of vitamins. In addition to these potential inconsistencies, excessive consumption of gummy vitamins is linked to a plethora of health problems some of which include frequent urination, increased calorie intake, and side effects due to consumption of enormous quantities of vitamins. Due to these factors, numerous organizations are questioning the effectiveness of gummy vitamins. Manufacturers face a colossal challenge of improving the nutritional value offered by the vitamins while keeping the flavors intact. As the name suggests, gummy vitamins are dietary supplements that provide nutrition. Available in a variety of flavors, gummy vitamins provide an alternative for vitamin pill and tablets. The vitamins are used for children as well as by adults with an aversion for pills. Fact.MR recently published a report on the gummy vitamins market, which features authentic and accurate information about the gummy vitamins market along with a future forecast for the period 2018-2028. All the key market aspects that influence the market currently and will have an impact on it have been assessed and propounded in the report. The gummy vitamins market report offers a comprehensive market breakdown on the basis of value, volume, CAGR, and Y-o-Y growth. A market attractiveness analysis on the basis of product type, source type, consumer orientation, region, sales channel, and packaging type has also been included in the report. Which consumer segment accounted for the highest sales of gummy vitamins in 2018? Which region offers the most lucrative opportunities for the gummy vitamins market in 2019? 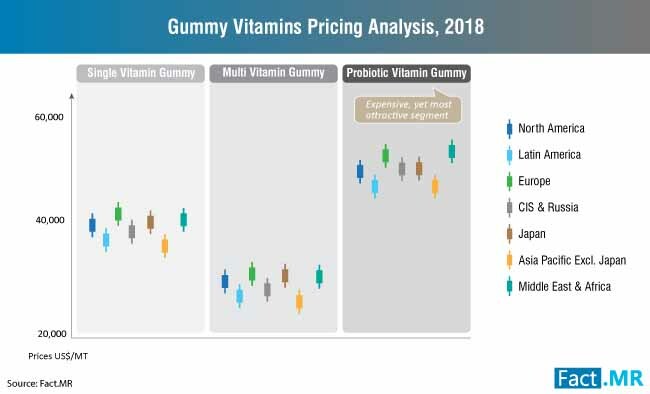 What gummy vitamin product types will be the most in demand in 2019? What sales channel will account for the largest sales in 2019? What are the major challenges facing the gummy vitamins market? A robust and exhaustive research methodology was employed while compiling the gummy vitamins market report which has been thoroughly explained in the report. The elaborate research was conducted in two phases namely primary and secondary. While the primary research phase involved interviewing industry savants and thorough company case studies, secondary research was conducted by comprehensively studying trade journals, company press releases, and other industry publications.